Alcat, a very good friend of mine, has had his YouTube account for more than 2 years now. He was born in SF and was a wannabe video blogger after being inspired by the likes of Bre Pettis and Steve Garfield at Gnomedex 2005. He never quite got his act together, however, and languished behind the scenes, licking his paws. Until he found Seesmic. It was easy to post quick, often rude and argumentative videos there and he liked it. He liked to mime. People seemed to like him. He performed for them. He answered their questions. He joined in their conversations whilst feeling slightly “luckier” than the other cats there because he, unlike the rest, had the power of speech. And he wore wigs well. He went to SXSW and there he found he could at the same time delight and frighten people. Was he real? Why was he talking? He collected stickers. He ignored those who stared as they passed him talking into the laptop in anticipation of sessions. He marvelled at the people and their geekery. He liked what he saw. Now, it seems, he is not alone. And he is pleased. When once people scoffed at his video ambitions, taunting him with cries of “but you are a puppet”!, now people are paying for other such felt fellows in video form. Even Flickr is doing it to launch their video service because they have realised that humans are essentially boring. Alcat welcomes this. The internets is a big place. There is enough space for all the puppets in the world. * He has even encountered the Feldman man on Seesmic and he looks forward to more encounters of the felt kind. Except he is furry. Superior to felt. *Never must he be called “puppet” to his face. Note to self: the music crowd wear their badges hanging off their belts. The geeks stick them around their necks. What does that say about them? Anyway, roll on next year: check out Jemima Kiss (Guardian), Chris Vallance (BBC) and I as we take a stroll down Cool Strip Number 6. *The likelihood of me ever fitting into my skinny jeans again is oooohhh ZERO after all the animal flesh and hops I have consumed this week. Just when I was starting to wonder what interesting thing I had really seen at sxsw (apart from a couple of sessions friends participated in), along came Jane McGonigal’s keynote. I knew it was The One I Must Not Miss while I was here. It did not fail to please. She has been the only one I have seen who has actually introduced some fresh(ish) academic theory into her talk – that of Happiness. She talked about 10 skills that games can give you which ultimately give you a better quality of “life”. Hence, why there is a mass exodus to virtual worlds. emergent sight: you can spot patterns – things you weren’t expecting: being comfy with messy complexity (eg lost ring – multiple languages): seeing opportunities in messiness. The thing about games and virtual story worlds – no matter how graphically sophisticated (or not) they are – is at least they give you feedback and points for doing things. That way we know instantly what our strengths and weaknesses are, and how we are doing. We don’t really get that in everyday life. Then of course, she ended the session with a spontaneous Soulja Boy dance. As you do. 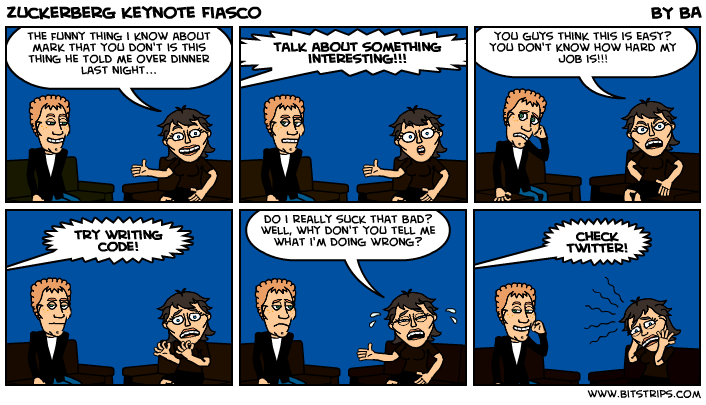 Courtesy of newly-launched and very cool Bitstrips.